Yoga with Andrea on retreat: There will be 2 daily classes with one afternoon off to explore the region. The morning session will begin with meditation and pranayama practice, followed by asana, chanting, philosophy and relaxation. The class will explore an in depth philosophical theme that we will expand on during the day, giving opportunity for reflection and study. Jivamukti yoga is a method of hatha yoga that weaves together the physical, psychological and spiritual aspects of yoga to form a deeply holistic experience on the mat. Each class is derived from the ancient texts of yoga. The afternoon class will include deep restorative postures and yin yoga, holding passive poses for longer times to release layers of stress and tension. 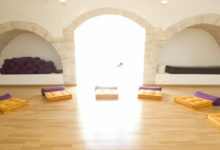 The afternoons are deeply relaxing and offer a perfect balance during the week of variety of yoga styles and practices. All levels of yoga are welcome in particular students who wish to take their practice deeper in study. Evening will close with either a group yoga nidra or meditation session. Andrea’s retreat 6-13 August at Alpino Atlantico is designed for intermediate/advanced students only. If you’re a beginner and would like to travel with Andrea you can join for her retreat 13-20 July at La Rosa. More about Andrea: Andrea is an Advanced Jivamukti certified teacher, and a mentor on the Jivamukti teacher training , a 500hr Senior yoga alliance teacher and Level 2 yin yoga teacher with Insight yoga. She is also certified to teach Restorative yoga. 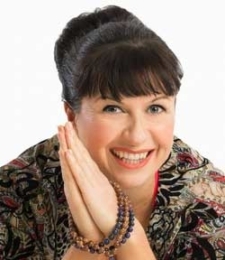 Andrea is known for her passionate, dynamic and inspirational teaching that incorporates both the physical and spiritual aspects of yoga from the lineage of her gurus Sharon Gannon and David Life and their gurus Sri K Pattabhi Jois, Sri Brahmananda Saraswati and Swami Nirmalanda. Her classes integrate deep bhakti infused practices with the application of precise alignment and deep spiritual intention. Andrea believes yoga can enable us to create self-awareness, acceptance and compassion for living a full and spiritual life. Being a passionate vegetarian and vegan since the age of 14 she includes this philosophy into her teaching. Andrea trained as a professional dancer and traveled all over the world in her career. It was during this time in her mid-twenties she took her first yoga class and it sparked an interest in eastern philosophy and in particular Tibetan Buddhism that she draws from in her teaching. Andrea has been teaching yoga since 2001 and has trained teachers for the BWY, she enjoys mentoring and developing new teachers through workshops and courses. In 2004 she was given the Jivamukti yoga book by a friend and then began to study the method completing the teaching training in New York with Sharon Gannon and David life in 2005. As an Advanced certified teacher in the method, she has assisted her teachers many times and assists on the Jivamukti Immersion programme. She has taught at Jivamukti centers in Europe including Jivamukti Berlin, Peace yoga and The Looking Glass in Basel Switzerland. Andrea is also a certified Level 2 Yin yoga teacher and continues to study with Sarah Powers developing her inter discipline approach of yin yoga, Buddhism and in-depth psychology. Her other main teacher is Judith Hanson Lasater studying Restorative yoga with her and continuing to take her online courses. I have been teaching retreats since 2003 my first retreat was in Egypt. My inspiration is drawn from my practice, the styles I teach: Jivamukti, Yin and restorative yoga . I continue to read a lot. I love Judith Lasater and Iyengar as references and I love going to classes and workshops and planning with new ideas. My classes are infused with the Jivamukti tradition from my gurus Sharon Gannon and David Life, music, fun, inspiring asana sequences, pranayama, chanting, philosophy. meditation and relaxation. Dharma talks are part of my class, helping us all understand why we are practicing and what and who we are doing it for. I love teaching on retreat as it brings me closer to the students, takes them away from their every day environment to really focus on the practice. I think it’s fantastic to just leave them in savasana at the end of class, we can explore and go deeper into the practices and just jump in the pool after asana!